Early in the year, I shared a powerful video about the right to keep and bear arms. It featured the Sheriff of Milwaukee County in Wisconsin, who made a public service announcement advising citizens that gun ownership was important for self defense. That’s such a common-sense point that it presumably shouldn’t have merited any comment, but it was newsworthy because the establishment press frequently tries to promote the narrative that law enforcement officials are opposed to the Second Amendment. But in virtually every instance, the “officials” are big-city police bosses who are parroting the views of the political masters who appointed them to their positions. So what do regular cops think about gun control? I’ve always assumed they favored the right to keep and bear arms. Simply stated, cops have a practical understanding that there are bad people in the world. Moreover, they know it’s impossible for them to be everywhere at once, so armed citizens are the first line of defense. And the cops that I know are strong defenders of private gun ownership, but I haven’t wanted to extrapolate from that anecdotal evidence. So I’m not surprised that police officers are against gun control, but I had no idea that cops were so overwhelmingly solid on the Second Amendment until I saw the polling data from this survey of 15,000 law enforcement officials. 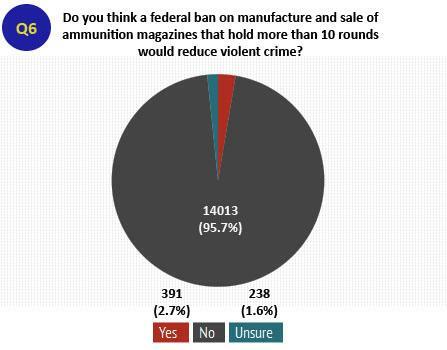 Here are two of the most startling findings, beginning with a question on whether magazine limits will be effective in reducing crime. An astounding 95.7 percent of respondents say no. Makes you wonder whether Andrew Cuomo and other sleazy politicians understand that they’re pushing policies that will have no positive impact? Or whether they even care? Perhaps all lawmakers should be required to read Larry Correia’s article on the real-world impact of such policies. But what about “assault weapons”? Well, 91.5 percent of cops said a ban on these semi-automatic weapons would either be useless or the policy would have a negative impact on fighting crime. 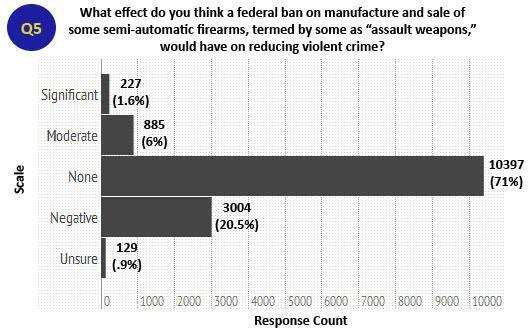 Indeed, almost three times as many cops said the effect would be negative compared to those who thought a ban on these guns would have a moderate or significant positive effect! In other words, cops understand instinctively and through practical experience what scholars such as John Lott have discovered through research. Interestingly, it appears cops are even better on the Second Amendment than ordinary Americans. According to this polling data I shared back in January, “only” 58 percent of Americans understood that more guns would reduce crime. But I’m still proud of these ordinary Americans. An overwhelming 65 percent of them said they would disobey laws designed to confiscate their guns. P.S. While I’m very glad that police officers support the Second Amendment, there are some cops who deserve scorn because of what they do to me and what they do to innocent 10-year old kids. P.P.S. If you enjoy anti-gun control humor, here are lots of amusing images and funny videos. Those who rely on guns and bullets to “save” them are filled with fear. They believe their brothers are out to get them, and that there is no loving Creator to protect them. Is there data that shows the political orientation of cops in general? The results from the survey support the pro-gun camp, but maybe this is an obvious fact given the subset of individuals that choose law enforcement careers. Or maybe it’s not. There is one reason that cops have to be anti-gun that the average citizen doesn’t have. In some jurisdictions, it is impossible or very difficult for a non cop to get a permit to carry a weapon. In those jurisdictions, the vast majority of the armed guards are off duty cops who take those armed guard jobs for extra income. And because of the laws of supply and demand, and since the cops have a monopoly to carrying guns in those jurisdictions, they can make a huge amount of money doing that. So, in spite of that reason, it’s good to see that the vast majority of cops are pro-gun, in spite of the monetary reasons for them to be anti-gun.